Valuable jewellery belongs in a safe. The material value alone is often considerable, but the intrinsic value of jewellery is always much higher, and sometimes incalculable. Jewellery has its own story to tell; perhaps it is an heirloom inherited from a loved one, a gift received on a special occasion, or simply an item purchased as a reward for an outstanding success, so the theft of rings, bracelets, necklaces and watches is always a particularly hard personal blow. No amount of insurance compensation can ever replace the memories associated with an individual piece of jewellery. 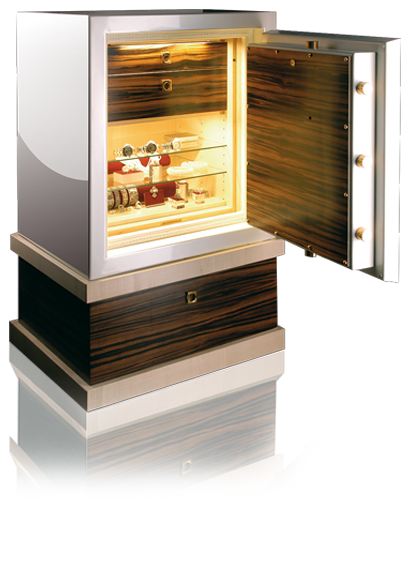 Jewellery safes from the premium line “Signature Safes by HARTMANN” represent the highest level of elegant, stylish security – the perfect safes for discerning customers with exclusive tastes. HARTMANN TRESORE has a proud tradition of around 150 years of craftsmanship and, since specialising in the production of safes in 1983, has made its name as one of the leading safe suppliers in Europa and the Middle East. The high-end brand “Signature Safes by HARTMANN” combines superlative security with individuality. “Signature Safes” are manufactured exclusively and unreservedly in accordance with our customers’ special wishes and requirements, often for the secure storage of watches and jewellery. These jewellery safes leave nothing to be desired, neither in terms of external appearance nor of interior fittings and fixtures. These jewellery safes can be installed discreetly in concealed locations, but also as an attractive yet secure, visible feature integrated in the interior décor of a house. So if you would prefer to display your safe as a piece of modern household furniture, jewellery safes from HARTMANN open up a world of new possibilities. The safe exterior can be elegant, glossy black or an exquisite, subtle shade of cream. Virtually any colour is possible – the customer’s personal style is decisive. Even pink or multi-coloured patterns are possible options. The safe can be upholstered with leather or panelled with hardwood to blend in with the rest of the furniture in your home. The fittings and lock are variable, too – even gold plating is available on request. The safe can be modern and stylish or have a retro vintage look – there are no limits! The same also applies to the interior of your jewellery safe. A wide selection of hardwoods is available for the fittings – mostly drawers, which can also be combined with open shelves. The drawers can be lined with velvet or Alcantara, but also with luxurious felt or leather. You are free to choose the material which offers your jewels the best protection and shows them to their full advantage. Security is obviously always the main priority when choosing a safe. Jewellery safes from the “Signature Safes by HARTMANN” line are no exception, despite their individuality and exclusiveness. All safes are tested and certified to current European standards, and can also be fitted with components to enable connection to an electronic home security system. Nevertheless, the safe should still be securely anchored to ensure that it cannot be removed in the event of an attempted burglary. The smaller and lighter the safe, the more important it is for it to be securely anchored. The choice of lock is also crucial: electronic locks offer the advantage of having no keys that need to be kept in a safe place. They often have useful additional functions, too. For example, a time delay can be installed to ensure that the door cannot be opened until a certain period of time has elapsed after entering the code. The biometric fingerprint locking system is a particularly convenient solution: simply swipe your finger across a scanner to open your jewellery safe – an easy, comfortable solution that offers top-level security! We will be happy to advise you about which system is the best for your requirements. An individualised, custom-built jewellery safe is not only a secure place to keep your valuable jewellery, but also an expression of your personal style. Safes of this kind are no longer hidden away in a dark corner, but instead deliberately set up as the focal point of a living room, bedroom or office. Naturally, customers who choose this option want the safe to harmonise with the style of their other furniture and décor. Perhaps your jewellery collection consists of exceptional individual items that you would like to keep on permanent display? If so, your jewellery safe can be fitted with bulletproof glass doors that turn it into a display cabinet. A bulletproof glass safe adds an entirely new dimension to any dressing room! Whatever your jewellery safe looks like on the outside, the interior fittings will be adapted to meet the requirements of your collection and comply with your wishes. Customers with a large number of rings will probably want drawers with ring racks and lots of small compartments. Special compartments for bracelets, earrings and other items are also available, of course. Tiara owners need more space between compartment dividers, and customers with valuable watches might need some space for one or more watch winders. If you have one special item that is exceptionally valuable, a special inner safe-within-a-safe can also be fitted. Drawers can be made entirely of wood, or fitted with glass fronts or bottoms; naturally, LED illumination to display your collection in the best possible light is also available. The configuration possibilities are almost unlimited, because your jewellery safe is adapted to your individual requirements, wishes and ideas – down to the smallest detail. We therefore recommend that you make a full assessment of your collection before joining us in designing your own personal jewellery safe. The unique jewellery safes from our high-end brand range “Signature Safes by HARTMANN” are custom-built and individually equipped to suit your requirements and wishes. If desired, we also offer professional delivery, installation and anchoring of your safe. As part of our after-sales service, we will be glad to answer any questions about your “Signature Safe” long after you have purchased it. Protect your valuable jewellery in an elegant jewellery safe that has been individually designed to suit your requirements. Combining outstanding security, stylish design and appropriate care and storage, a HARTMANN jewellery safe is the perfect way to protect your most valuable items and precious mementoes. After all, jewellery represents much more than its material value alone. If you are looking for inspiration for the design and fittings of your own individualised jewellery safe, our photo gallery may help you. If you already have some ideas of your own, we look forward to working with you to design your own uniquely individual jewellery safe. Let us show you that beauty and security are not a contradiction in terms. We harmonise your wishes with technical security aspects, working with you to design your individual jewellery safe. Our jewellery safes are tested and certified to standard EN 1143-1 by independent, impartial certification institutes – security you can rely on! We will build your jewellery safe in accordance with your wishes and requirements – with special compartments for your rings, necklaces and colliers!